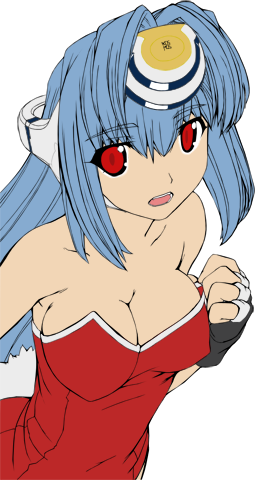 So I’m finally done with my vector image of KOS-MOS. As soon as I got home from my friend, I continued work with this. And I’m really pleased at how it turned out. You can see the original post I made about this vector here. I skipped on making her chocker, since it turned out to be a bit hard for me. So I just went ahead and finished the picture without adding it. And I’m still very pleased with how the picture turned out. Hopefully I’m better by the next vectors I make, so I can add it to future pictures. If you want a bigger picture of this I recommend heading over to my DeviantArt page and get it there. Its much bigger than the little preview I have here on the site. So if you really want to see how the picture turned out, head over there. I would also appreciate if people would comment, so I know what to improve or just to hear what you think. So looking forward to hear what people think, since its what motivates me to continue doing work like this. Can’t wait to get started on my newest vector, or perhaps I should try and finish some of the old ones I have. Well for the bigger version of this vector, get it here! 2 responses on My KOS-MOS vector, done!